"The German is like a willow. No matter which way you bend him, he will always take root again." 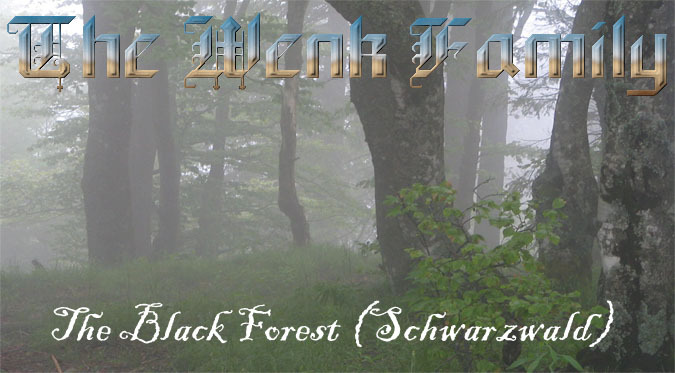 Our Wenk line is 'Swabian' (Schwäbisch in the German language), coming from the Grand Duchy (Großherzogtum) of Baden, in what is now the Black Forest (Schwarzwald) in Germany. This beautiful land covered the eastern half of the fertile valley of the Rhine, with a majestic range of mountains forming its boundary. 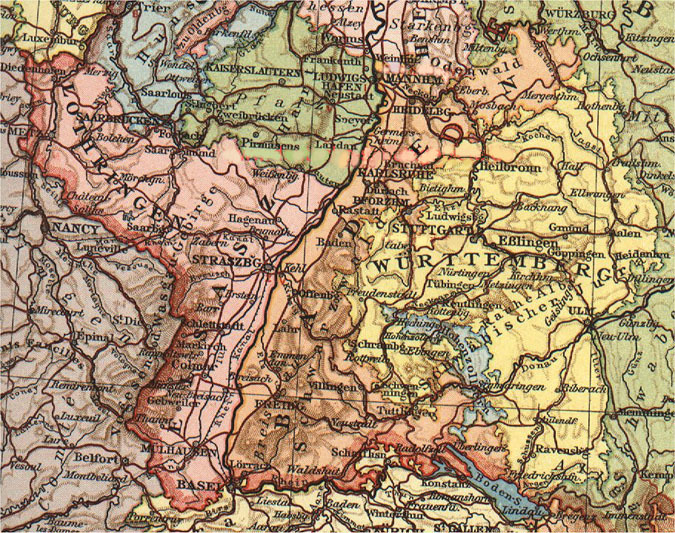 To the north lay Bavaria and the Grand Duchy of Hesse-Darmstadt; to the west (and practically throughout its entire length) was the River Rhine, which separated it from the Rhenish Palatinate and the Alsace; to the south was Switzerland, and to the east the Kingdom of Württemberg, the Principality of Hohenzollern-Sigmaringen, and Bavaria. (Today Baden is part of the German state of Baden-Württemberg). These countries all took turns invading each other, and then banding together with their former enemies against the other kingdoms, like France, depending on the mood of the current rulers. It was basically one large game of RISK, only played with real lives. It made life interesting for the rulers, but horrible for the peasants who had to actually fight in those wars... But then the people in charge rarely cared how the peasants felt about it, anyway. The 'Black Forest Swabians' of Baden spoke a dialect of the German language that is different to this day. They tended to be short in staure, often stout, and dark-haired, in contrast to the taller, fair-haired northern and central Germans. Baden's dynasty goes back to the Counts of Breisgau whose title traces to the 10th century. The Margraviate of Baden (Markgrafschaft Baden) was established on April 27, 1112. Over the centuries, more territories were added to their land. With the death of Berthold V in 1218, his branch of the family became extinct, and its freehold estates passed on to the margraves of the other branch, whose descendants are still the reigning family of Baden. The first of the line of margraves of this branch was Hermann I, who died a monk in the Abbey of Cluny. Many of his descendants distinguished themselves in the affairs of the Empire, as, for instance, Hermann V (1190-1242), who fought against the Mongols, Rudolf I (1243-88), who was first the enemy and then the friend of Rudolph of Hapsburg; Bernhard I (1372-1431), a generous patron of the monasteries of Gottesaue and Schwarzach; and James I (1431-53), who endowed the collegiate foundation in the city of Baden-Baden. The intellectual, spiritual, and economic life flourished in Baden at this time. Along the Upper Rhine, the arts and learning were nurtured in intermediate schools, and in the Universities of Heidelberg, and Freiburg, which had a large attendance. 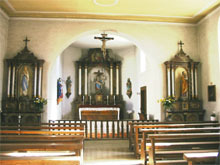 The arts and literature were also cultivated in the monasteries. 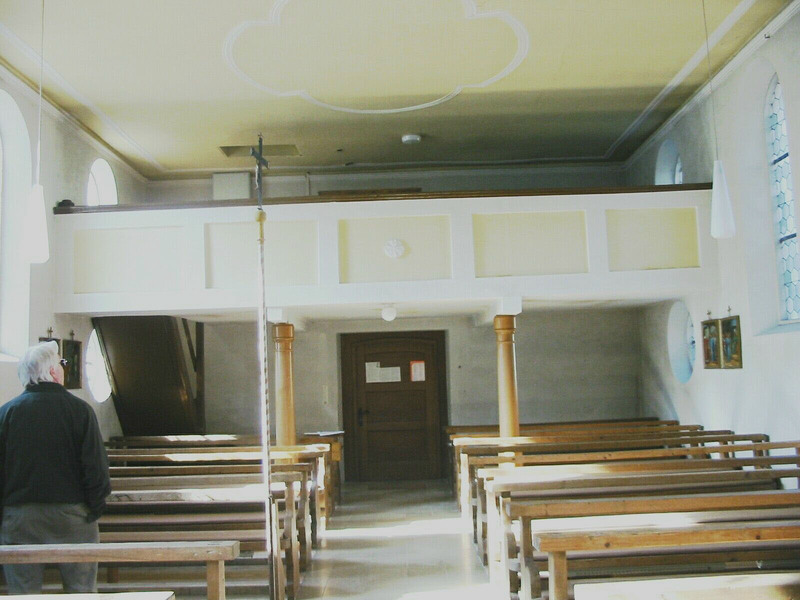 The first impulse to revolutionize religious ideas in Baden came from an Augustinian monk and theology professor named Martin Luther. He had earned a doctorate in theology from the University of Wittenberg in the early 1500's. In 1518 he spent some time in Heidelberg, where he appeared as a public speaker and planted the seeds for change. The Reformation first took firm root in the Countship of Wertheim, in Constance (1530), in the Countship of Hanau-Lichtenberg (1530), and in the electoral palatinate (1546). 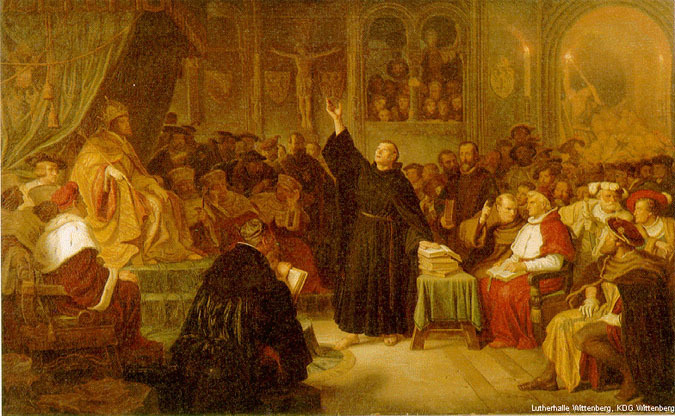 Martin Luther speaking before the Holy Roman Emperor at Worms. But the progress of the Reformation in the Margravate of Baden was far from being uniform. Much of the population of Baden-Baden abandoned Catholicism and adopted Luther's teachings, but at the death of Bernhard III (1536), Duke Albert V of Bavaria, the guardian of Bernhard's son, Philip II, brought the country back to the Catholic Faith. Philip himself (1569-88), who had been educated by the Jesuits at Ingolstadt, became a vigorous opponent of the new teaching. The Baden-Durlach branch of the royal family laid claim to Baden-Baden during the reign of Philip's successor, Edward Fortunatus, (1588-1600). They occupied a part of the country until 1622, and introduced the Reformation. But Margrave William (1622-77) finally succeeded, with the aid of the Catholic party in the Empire, in gaining the undisputed mastery of the margravate. His successor, Louis William (1677-1707), rendered many services to the Church and the Empire in fighting against the Turks (1683) and the French. Louis William, his wife, Augusta Sibylla, as regent for their son Louis George (1707-61), and the last named in his turn notably furthered the interests of the Church of Baden. With the death of Augustus George (1761-71), who by papal dispensation had left the ecclesiastical state, and who founded many religious institutions, the line of Baden-Baden became extinct, and the succession fell to the Baden-Durlach branch. Margrave Ernest (1527-53) of Baden-Durlach had favored the Reformation, and his son Charles II (1553-77) soon established the Reformation in his domains. After this time the Protestant religion remained dominant in the land of Baden-Durlach. The most noted of the Baden-Durlach rulers were: Frederick V (1622-59), who founded many schools; Frederick VI (1659-77), who distinguished himself by his devotion to the emperor and the Empire; Charles William (1709-38), who in 1715 established the present capital of Karlsruhe, greatly improved the finances and the administration of justice, and zealously promoted the interests of the schools. But the life of an individual in Baden was only partly concerned with obligations to the noble lord (landlord) or the church. More than anything else the social class of the village into which he/she was born determined the whole life. There were three village social classes in the area that is now called Baden-Wuerttemberg, during the period of 1500 to 1800: The first class consisted of wealthy farmers or Bauer; comprising 2-5% of the population. They possessed the big farms. Generally, smaller parts of their farm were owned by them and larger parts were obtained by fief (German = Lehen, Schupflehen, Erblehen) from a landlord or the church or a monastery. The Bauer also occupied the important village positions, like Vogt (Governor), village judge, etc. The word "Bauer" not only denoted the profession of a farmer, but was also used as a title. A Bauer had to have at least two horses and/or bulls and one plow. A wealthy first class Bauer had six or more horses and a net worth of more than 1000 fl. (guilders). The Gärtner (common farmers) made up 60-80% of the population, and were considered the second class. They possessed land, also obtained by fief. These farmers worked hard, and usually were able to have a modest standard of living for themselves and their families. The third class consisted of the Tageloehner (day laborers), also called Seldner in Southern Germany, and they made up 20-40% of the population. A "Tageloehner" possessed not much more than a cottage, a vegetable garden and possibly, a goat and some chickens. They worked for the other farmers for day wages. In order to get a feeling for the disparity of wealth in this system, here are some figures from ca. 1800: a good horse cost about 100 guilders, a bull about 40 guilders, and an old cow 15 guilders. The daily (12-hour day) wage for a "Tageloehner" was six Kreuzerthat is one tenth of a guilder! In other words, the Tageloehner class was very, very poor, and had few pleasures in life. As a consequence, they had many children, but because of the level of poverty and poor health conditions, many of those children died immediately after their birth. First of all, marriage was only allowed with the permission of the noble lord ("landlord"), and the engaged couple had to pay the lord for his permission (2-10 fl). Secondly, the couple had to prove to him and to the community that they would be able to support themselves and their children without any outside help. A minimum net worth of 100 -200 fl. was required for marriage. Apparently Joseph and Maria made the cut. It was actually a good time to raise a family in Badenthere was peace, there was prosperity, and the educational system was one of the best in Europe. Joseph and Maria had their first child that very September. JOSEPH WENK was born on September 21, 1733 in Russwihl, Baden. Family listed below. UNKNOWN WENK (a child was recorded as being born, but nothing else is known). Their child, JOSEPH WENK JR. (21 Sep 1733 - 17 Aug 1797), married MARIA BAHOLZER (1743-1800), also of Russwihl, on the 10th of August in 1767. It was a good time for Baden. Charles Frederick (1738-1811), introduced salutary reforms in all parts of his territory, thus raising his country from the level of a petty principality to the rank of one of the greater central states of the German Empire. The extinction of the Baden-Baden branch greatly increased his possessions, which were still further enlarged by the political changes resulting from the French Revolution. Joseph Jr. and Maria moved to nearby Oberwihl, just southwest of Stuttgart, near the French border. (Waldshut, Freiburg, Baden-Wurttemberg, Germany: 47° 37' 0" North, 8° 3' 0" East; It was also incorporated with Russwihl into the district of Görwihl in 1975). The village was founded in the second period of colonization of the Hotzenwald area, with its neighboring village, Niederwihl. JOHAN MICHAEL WENK was born on November 13, 1772 in Oberwihl, Baden. Family listed below. There were rights for self-administration and self-jurisdiction of the villages like Oberwihl. The head of the village was the "Vogt" (Governor). The lord selected him out of the members of the community. Under him, two or three Buergermeisters (Mayors) were selected by the "Gemeinde" (community). Sometimes, communities owned considerable amounts of land and forest for common use. Johan Michael then obtained approval from the landlord and married MARGARETHA EICHHORN of Ebersbühl, Germany, but his young wife died before she could give him any children. The times were getting tougher for everyone in Baden. In 1796 Charles Frederick was forced to surrender his possessions on the left bank of the Rhine to France. But both Baden and Johan Michael were about to experience a rebirth. On February 3, 1801, Johan Michael remarried, to KATHARINA FALLER (27 Aug 1776 - 22 Sep 1843), also of Oberwihl. Meanwhile, Baden was expanding: Charles Frederick was compensated by the Imperial Delegates' Enactment (1803) for his losses to France. He received the Diocese of Constance, that part of the Rhine Palatinate lying on the right bank of the river, including the cities of Heidelberg, Mannheim, etc., parts of the Dioceses of Strasburg and Speyer, eleven religious houses and abbeys, and seven cities of the empire. 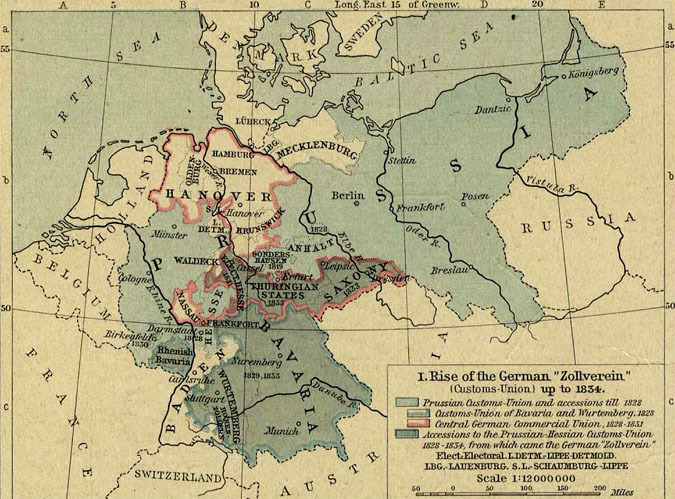 By the Peace of Pressburg (1805), and the accession of Baden to the Confederation of the Rhine (1806), Baden was further enlarged by the former possessions of Austria in the Breisgau, the city of Constance, and other territories. In the nineteenth century. 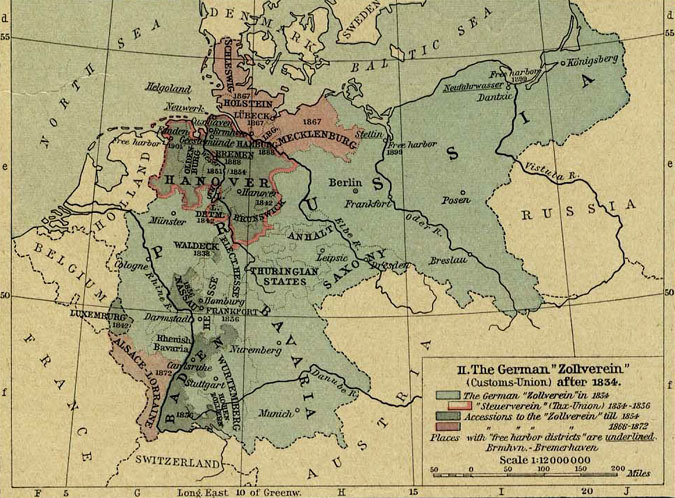 It was during this time which the general area where the Wenks lived went from being the Holy Roman Empire, which it had been for almost a millennium, to what is now more or less the modern boundaries Germany. Socially, the German people went from being a very oppressed people to earning more freedoms through revolution; life also improved with the implementation of many technologies made available for the first time to the general public by the increase in industry. On July 25, 1806, in the wake of Napoleon's victories, the Holy Roman Empire was abolished and Napoleon formed the Confederation of the Rhine. 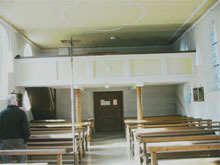 Sankt Blasien Abbey was dissolved in the course of secularisation, and the monastic premises were converted into one of the earliest mechanised factories in Germany. (The monks however, under the last Prince-Abbot Dr Berthold Rottler, found their way to St. Paul's Abbey in the Lavanttal in Austria, where they settled in 1809.) Baden was elevated to a Grand Duchy. Baden grew by 1810 to 15,000 square kilometers with a population of almost one million. In 1815, Baden became a member of the German Confederation... but it came at a price to its people. In return, Karl Friedrich was obligated to provide a contingent of Badeners for Napoleon's invasion of Russia in 1812. Most of the 7,100 Badeners in the Grande Armee would die in Russia. By 1815, having joined the allies, Baden provided 8,000 line troops and 8,000 Landwehr, and formed a Landsturm. Distrustful of citizen soldiers, the Grand Duke abolished the Landwehr and Landsturm shortly after the end of the war in 1815. JOHAN WENK, JR., b. 28 Dec 1801, in Oberwihl. He married IDA GASSMANN on 26 Feb 1829. Johan then adopted her son, IGNATZ GASSMANN, who changed his name to WENK. Johan Jr. died on 06 Jul 1867. JOSEPH WENK was born on 15 May 1803, but died before his first birthday, on 18 Feb 1804. The second JOSEPH WENK was born on 18 Apr 1805. He died before his second birthday, on 10 Feb 1807. KATHRYN WENK was born on 20 Jan 1807. She died on 27 Sep 1807. KATHARINA WENK was born on 30 Apr 1811. No further record. Still another JOSEPH WENK, born on 23 Oct 1814. He had a full life (comparatively), dying on 17 Feb 1871. MARIA WENK was born on 16 Jun 1816, but she died on 14 Feb 1817. VINZENZ WENK was born on 22 Jan 1819. No further information. Fortunately for us, JOHAN WENK, JR., was one of the few Wenk children to make it out of infancy. 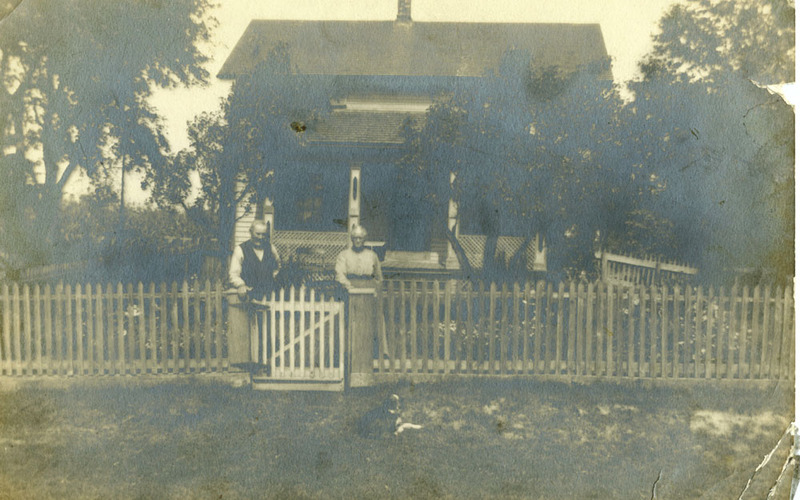 He became a middle-class farmer and lived in a time of relative good fortune for that area. The potato was the chief product of the town, and it sold well all over the region. Most of the farmers had a sideline profession that was usually handed down from father to son. In the upper class: an occupation that brought in the most money, like an innkeeper. In the middle class, jobs included smith, cartwright, cooper, tailor, shoemaker, etc. In the lower class were such professions as weaver, ropemaker, tanner etc. We know than Johan's son, Joseph, was a tailor in Michigan, so it's safe to assume that Johan was too, as it was a typical job for a middle class bauer. However, Ida had been previously married. Her first marriage was dissolved in 1822. Although that union ended badly, one good thing did come out of it, in that it brought her a son, IGNATIUS "IGNANZ" "IGNATZ" GASSMANN was born on 30 Jul 1823 and baptized on 31 Jul 1823 at Katholisch, Hochsal, Waldshut, Baden. 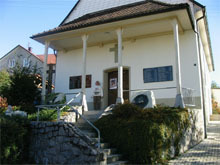 The church in Rotzell where Ignatz Gassmann was baptized. This was an unusual occurance in Germany: Adoption law in Germany was based on Roman law, under which the institution of adoption enabled childless couples to transfer their names and estates to posterity. Adult adoption was the prototype. The adopter would adopt an adult who he deemed suitable as a successor of his business or estate and future bearer of his name. (This model prevailed in the civil codes or statutes of the German states during the 18th and 19th centuries, and was also incorporated in the German Civil Code of 1900, and remained this way until 1976, when the law was reformed to reflect changing attitudes and that it had principally become an institution to provide a new home for children). Adoption was constructed as a contract between the adopter and the adoptee rather than a government decree regarding a child.³ So the bond between Johan and Ignanz must have been strong. Johan Wenk, Jr. and Ida had seven more children, after Ignatz. But while their family grew, their village shrank. A history book of the Görwihl area, translated by Ernst Wenk, states that by 1854: "There is hardly another town where the differences between the living conditions of the 1830's and early 1840's and the present living conditions are more distinct than Oberwihl. At the earlier time all native plants thrived and particularly the potatoes were of such quality and grew in such abundance that the potatoes of Oberwihl, selling under the name 'Oberwihler,' were a popular market item all around. Additionally there were nearly in every house two looms that earned through the finishing of cotton good substantial income. But the people of Oberwihl were not insightful and reasonable enough to envision that the good times could change. 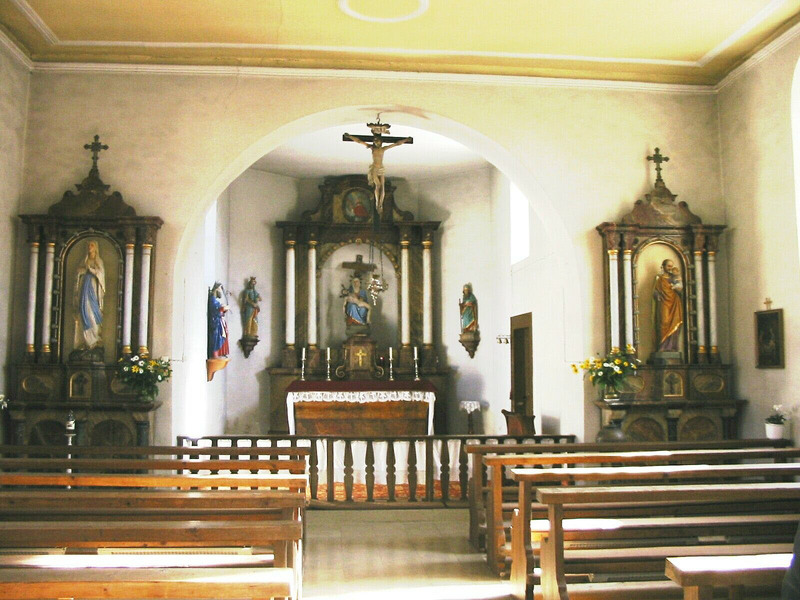 Proudly did they discontinue their collective church service at Niederwihl and built their own chapel in which they conduct now every Sunday and on holidays their separate religious services. The inns and pubs did marvelous business and everybody paid high prices. Now, with the times changed drastically, they cannot get over their being spoilt and the proper industriousness is not yet being developed. They have difficulties to forgo frequenting the inns and pubs and besides farming and cotton goods weaving they have never learned any other skills, so that today this large village does not have a blacksmith nor a carpenter." IGNATIUS "IGNANZ" "IGNATZ" GASSMANN was born on 30 Jul 1823, and baptized on 31 Jul 1823 at Katholisch, Hochsal, Waldshut, Baden (Germany, Births and Baptisms, 1558-1898. 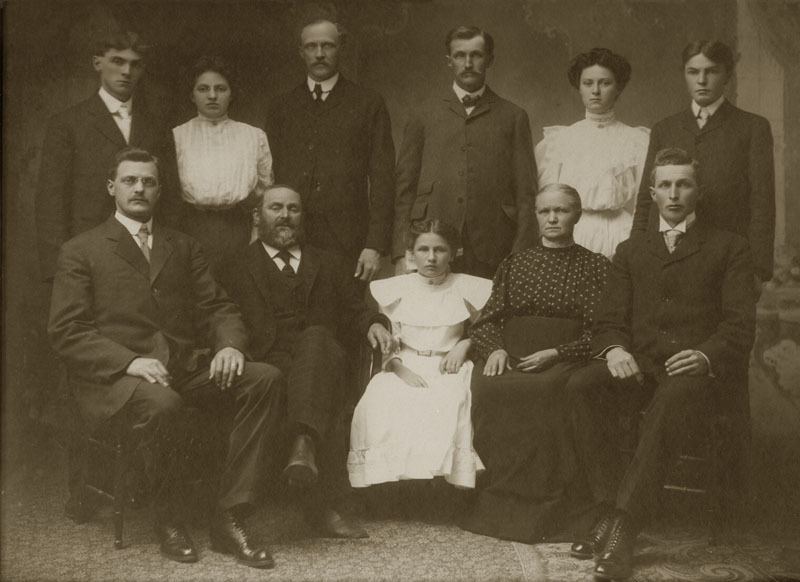 Salt Lake City, Utah: FamilySearch, 2013. FHL Film Number: 1055509); His name was changed to WENK after being adopted by Johan Wenk, Jr.² Ignanz emigrated to the United States in 1849, and his story is detailed in the next chapter of this genealogy. Ignatz settled in Freedom Township, Washtenaw County, Michigan. Ignatz married twice in America, first to Anna Maria Essig, and then after she died, to EVA CATHERINE MANZ (4/23/1837 - 1923). Ignatz died on 27 Jun 1897 in Washtenaw Co., Michigan. JOHAN WENK III was born on 30 Nov 1829 in Oberwihl. He became the Principal Teacher at Eschbach, and died on 01 Jan 1914. FRIDOLIN WENK was born on 04 Mar 1832. He died on 18 Nov 1856. MARIA WENK was born on 11 Oct 1834 and married a man named GOLDMANN. She lived well into her eighties, dying on 06 Mar 1923. KATHARINA WENK was born on 18 Dec 1836 and married a man named FALLER. She died of pneumonia, date uncertain. But it was probably after 1897, as Ignatz' obituary in 1897 reports that he has two living sisters. WILHELM WENK was born on 01 Mar 1840. He died on 06 Mar 1865. 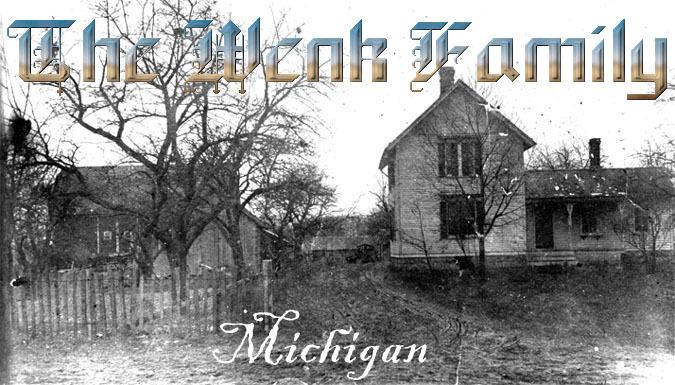 JOSEPH WENK was born in 1843 and joined his half-brother, Ignatz in Washtenaw Co., MI, in 1870. 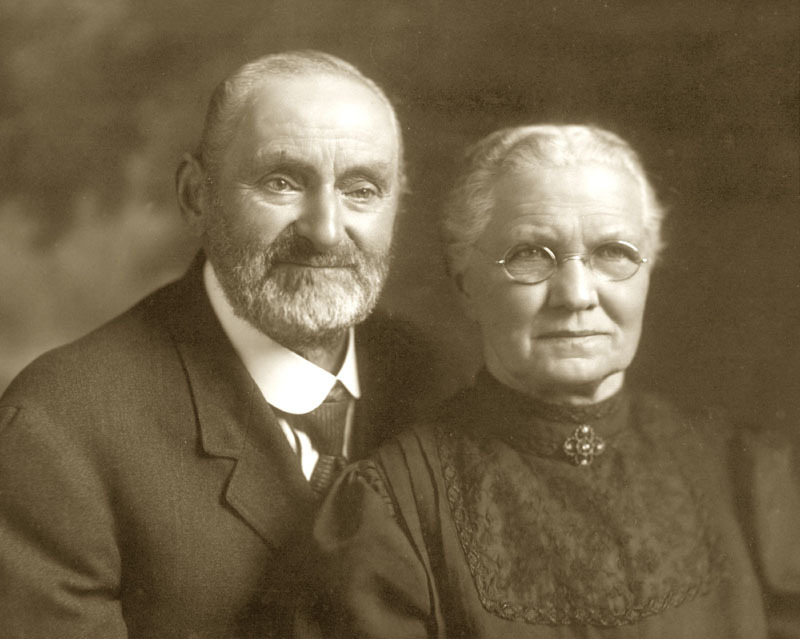 Joseph married ANNA ADELHEID "OLIVE" NIEHAUS (1849 - 1936) of Prussia, and had nine children: Adolph, Emil, Frederick, Albert, Edwin, Herman, Ida, Anna, and Clara. Joseph died on 13 Jan 1920 in Chelsea, Washtenaw Co., MI.  Click here to see Joseph and Olive with their family. Click here to see Joseph and Olive on their farm. Click here to read an account of their children. PETER WENK was born on 22 Jun 1848. He died on 26 May 1849. With a period of relative peace in the Germanic states in the first quarter of the nineteenth century, the population swelled and it became harder and harder to make a living. 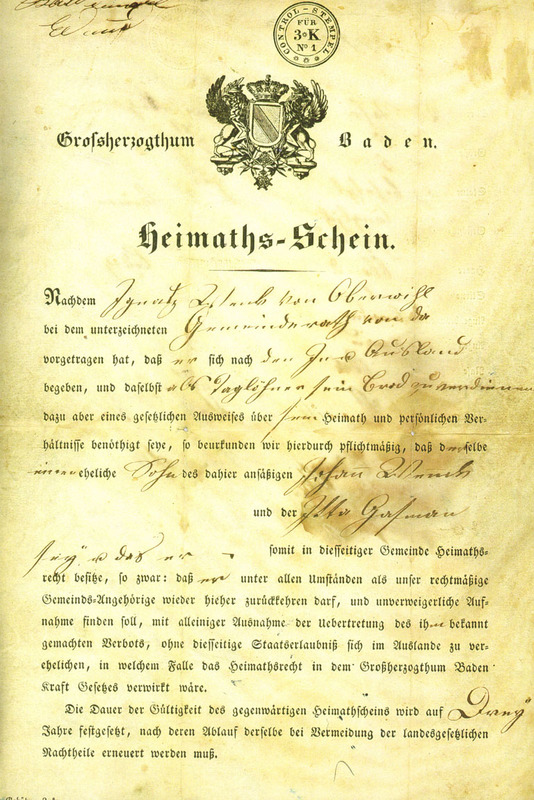 A history book of Görwihl translated by Ernst Wenk recorded that by 1851 Oberwihl, "counts 641 souls (residents), of these are 107 citizens of Oberwihl including 27 that have no possessions. The residents live in 74 thatched houses of low height that are scattered in the area. The inhabitants attempt to make a living through farming and labor. Cotton weaving brings earnings to only a few." 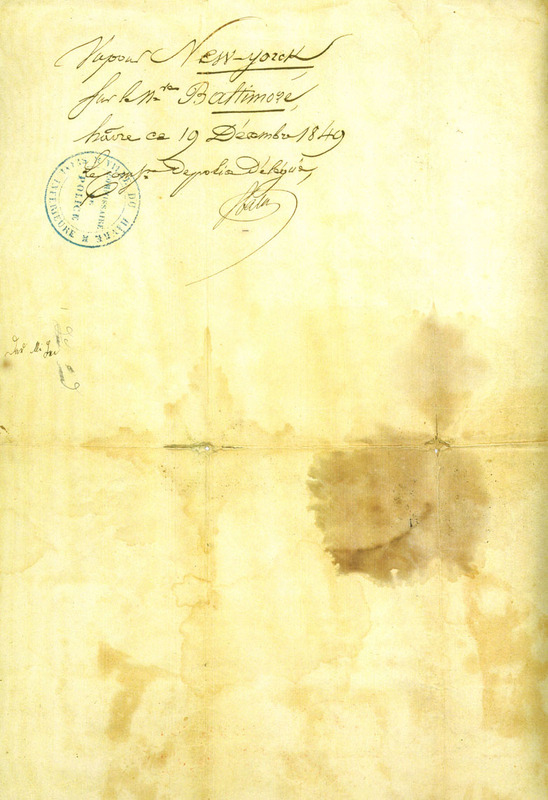 So with the only seeds in the area taking root being those of discontent, and despite the introduction of many reforms during the reign of Grand Duke Leopold (1830-52), there were often bitter rows between the Government of Baden and the people. In the course of these difficulties, the opponents of the government became more inflamed, until a leading party of opposition was formed with a strong inclination towards radical principles. With this political fighting, the revolutionary movement of 1848 took hold in Baden. Although the government granted many of the demands of the people for more liberal administration, violent protests and outbreaks still occurred. In the beginning they were suppressed, but a mutiny of the troops in Rastatt and Karlsruhe brought victory to the Revolutionaries. SOURCE INFORMATION: German Emigration records. In May of 1849, the insurgents took possession of Karlsruhe, proclaimed a republic. They established a provisional government called the Republic of Baden on June 1. Leopold then allied himself with Bavaria and convinced the Prussian army to invade his homeland, destroy the rebellion, purge the leadership, and with that basically decimate his own land. Finally, the revolution in Baden was repressed, and the Grand Duke reestablished his authoritybut now he ruled a wasteland. Severe punishment was meted out to the guilty, especially to the mutinous soldiers. A number of the them fled to the United States, and several served in the US Civil War. It's unknown how involved 24 year-old Ignatz became in the insurrections in Baden, or which side of the struggle he was on, if any. But we do know that he didn't wait around to see how it played outhe had already headed to America for a fresh start in May of 1848. The German refugees fleeing to the United States at this time, mainly from Baden, Vienna, and Berlin, became known as the "forty-eighters," because of the year of the uprisings that they escaped. Although most of the historical attention has focused on the revolution-minded intellectual "forty-eighters" who came to America between 1848 and 1855 and angered the public with their controversial (meaning anti-slavery) political views, the majority of Germanic immigrants were simple farmers and laborers who were just trying to earn a buck, including Ignatz. During the 1840's crop failures and potato disease had ruined many farmers, and they sought a fresh start. Most of the state authorities in the area attempted to repress emigration, but liberal governments in Baden and Württemberg were more lenient. If poor citizens and political offenders wanted out, they were happy to let them go. For the most part, emigrants were recruited from the middle and lower classes. Often a family group put all their money together in order for one of their sons to emigrate. They hoped that he would earn enough money in the New World to later pay for their crossing. In many cases, this happened. Upper class people only emigrated when a farm had been willed to one son (not too rare, the youngest one!) and this heir would give his brothers some money to find a new existence outside the village. Ignatz would accomplish this, and send for his younger brother, Joseph, about 20 years later. 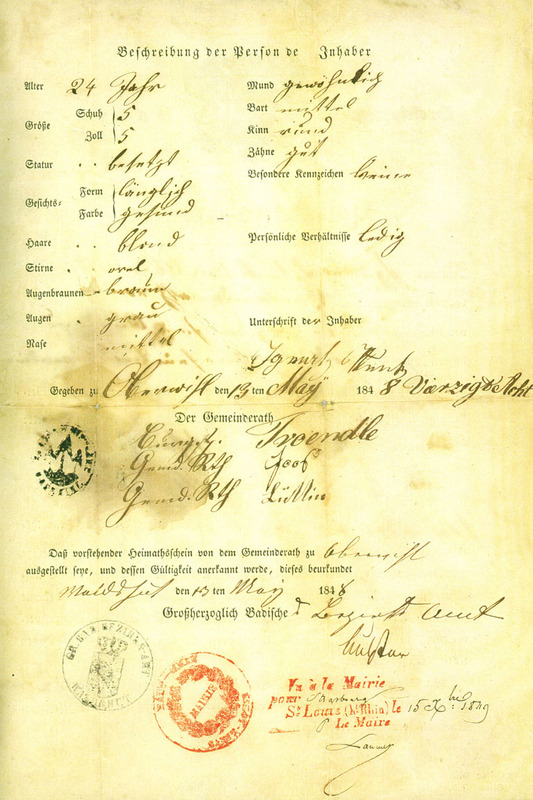 Ignatz' passport states: "Ignatz Wenk from Oberwihl told the village officers that he is going to the United States of America, where he wants to work to earn a living. He needs a document from his place of birth. We certify that he is the legal son of Johan Wenk, who lives here, and Ida Grossman (Gassman). Ignatz Wenk has the right to be a member of our village. He is allowed and welcomed to return here. There is one exception of the rule which he knows. If he should get married there without the permission of our State, the rights as citizen of our State will be taken from him." A travel document written on the 13th of March, 1848, lists him as a healthy man of medium stature, with blonde hair, gray eyes, and good teeth. He was headed for Baltimore by way of the port city of Le Havre in Northern France, through New York. He spent nearly all of the money his parents had given him and that he had saved up doing odd jobs just to buy the ticket. Whether he liked America or not, it was doubtful that he could ever make it back to Baden. So he said good-bye to his family and friends, probably forever, and started off. It was a bold move that changed the history of the Wenk family. In the next twenty years or so he would send for a wife and child, and eventually be joined by his younger brother, Joseph. ¹"A Brief Description of a Typical Southern German Village in the Past Centuries," by Dieter Joos Ueberlingen, Germany (djoos@dieter-joos.de). April, 2006. ²"wohl Namenseanderung oder Adoption, Kaum eire Legitimation! Ig(t) Gaßmann b~w Wenk ist darum lediglich Namenstrager und nicht Blutsverwandter!" 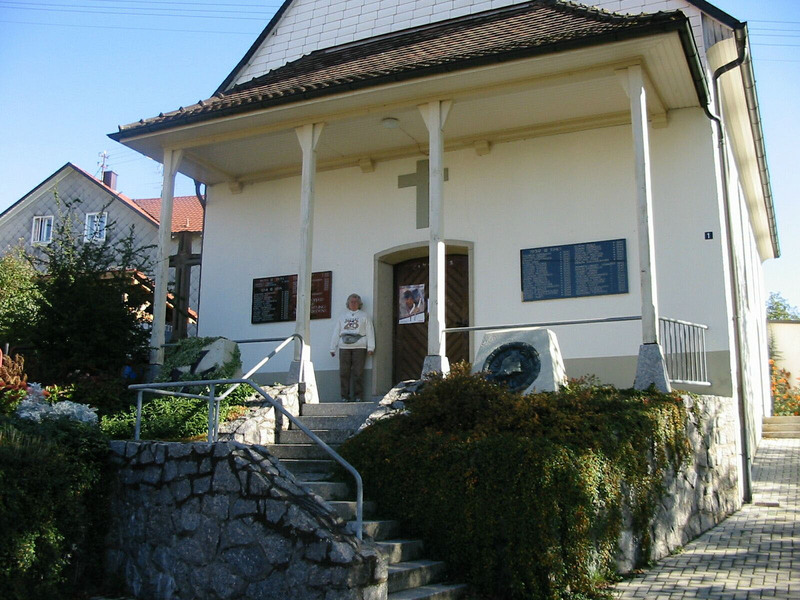 This event was unknown to the modern Wenk families, until Ernst Wenk made the discovery of the adoption in church records during the 21st Century. ³For a short overview of the historical development, see Bosch, Entwicklungen und Probleme des Adoptionrechts in der Bundersrepublik Deutschland, Zeitschrift für das gesamte Familienrecht, 1984, 829 ; for a detailed account see Engler, in: J. v. Staudingers Kommentar zum Bürgerlichen Gesetzbuch, Vol. IV., Familienrecht Teil 3b, Achter Titel, Vorbem., No. 1 ss. ⁴"From Germany to Washtenaw County: A Story of a German Immigrant and his Descendants in America," by Kurtis McDonald, 1997.